Drum-rolls to the long-awaited FREE admission concert! 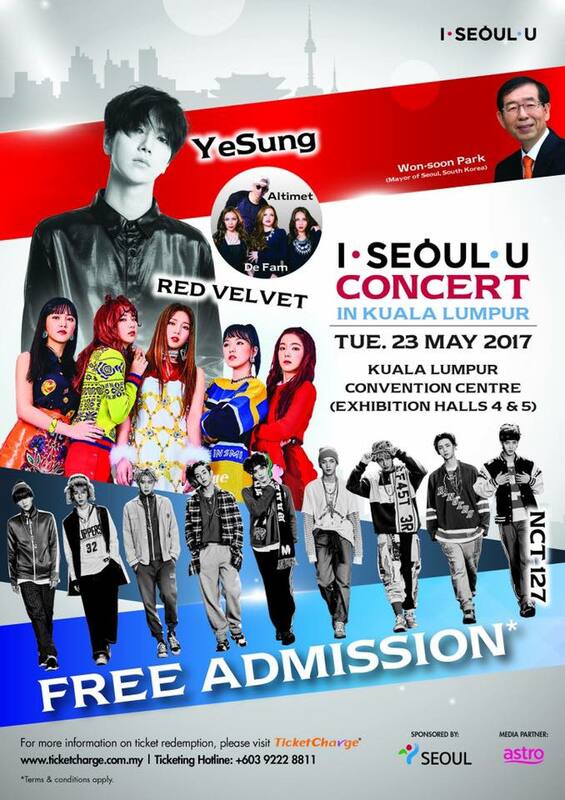 I-Seoul-U Concert features Super Junior's Yesung, Red Velvet and NCT 127 will be performing at KLCC Convention Centre, 7pm on 23 May. Malaysian rapper Altimet and pop trio De Fam will be the opening act for the day. In conjunction with this star-studded concert, the Seoul Metropolitan Government, the sponsor of the show will be hosting a Korean-themed pavilion at Pavilion Kuala Lumpur to promote Seoul as a key tourist destination. Fans can indulge in all your time favourite Korean items such as halal food, ski-jump in virtual reality experience, K-pop dance performances and more. Admission for both events are free, so fans who is interested in joining the concert may redeem the tickets at Ticket Charge from May 11 onwards. For more information on the ticket redemption, please visit www.ticketcharge.com.my or call +603 9222 8811. For Astro customers, you can redeem the concert passes via www.astrocircle.astro.com.my. I-Seoul-U Concert tickets via TicketCharge are fully redeemed in less than an hour. Fans who did not manage to redeem the tickets may stay tuned to Chingu and Universal Music Malaysia Regional Facebook Page for the tickets giveaway on the reserved seats! For your info, Chingu is giving 100 pairs of the Rock Zone tickets and UMM will be giving V1 & V2 tickets! Whooopss~ Don't miss your final chance to meet your OPPAs and ONNIs.